Los Angeles faces many serious educational challenges that require immediate solutions, including a declining student population, inadequate funding and an expensive housing market that makes it difficult for families to stay in L.A. These are all real issues that require careful planning to solve. Unfortunately, we fear these problems will take a backseat to the debate over capping the number of public charter schools in California. Instead of tackling underfunding by organizing a march on Sacramento, the L.A. Unified School Board, educators and parents were engaged in a lengthy, often heated debate in late January about the merits of charter schools before the board voted to support a temporary moratorium on the number of charter schools in the city. 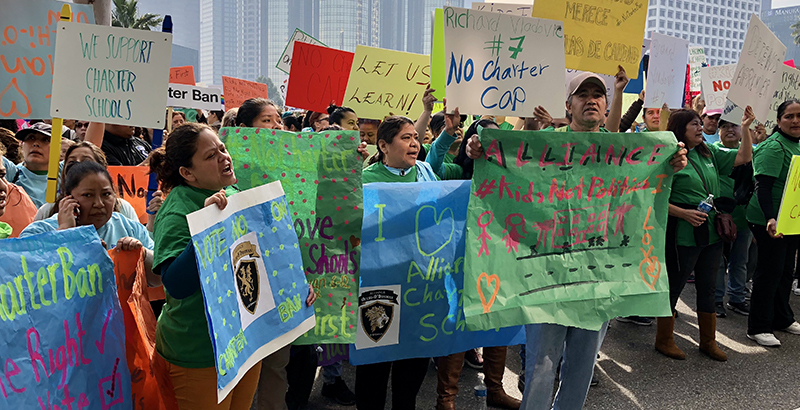 We understand that charter schools have become one of the most hot-button topics in education, but we know that terms like “charter campus” or “district school” are overly simplistic and have turned into distracting catchphrases. Instead of focusing on those divisive labels, we should be partnering to create school communities that prepare students for college and the workforce while also enriching students’ lives through experiences like arts and sports that will expand their worlds beyond the boundaries of their neighborhoods and communities. Overly idealistic? Unrealistic? We disagree. We know this is possible. As the former CEO and current union president of Camino Nuevo Charter Academy, we have seen it happen. When Camino Nuevo started in 2000, it was part of a broader community redevelopment effort that included a thrift store, a worker-owned janitorial company, a nonprofit community development corporation and a free clinic. The educational mission was to create a place that would nurture and support students in the greater MacArthur Park neighborhoods, the majority of whom come from low-income immigrant families. And given our grassroots origins, when our teachers decided to unionize in 2004, we committed to a collaborative and constructive partnership with student learning as our north star. When Camino Nuevo administrators and union leadership hold our monthly meetings, we do not focus on whether we are “union” or “administrators.” We sit down to communicate honestly and transparently with each other to find ways to provide a great education to all of our students. This collaborative approach was especially crucial during the recession, when we faced a deficit of nearly $700,000, about 5 percent of the operating revenue for our network of four schools. We all realized that unless we found a way to balance the books, we faced the possibility of having to close our doors, which would have been devastating to our students, faculty, staff, families and community. As we sat down in 2008, we saw that the root cause of the problem was not within our schools. Instead, it was a lack of state funding for public education. We also recognized that teachers and students were our most valuable assets. During discussions over the next several weeks, we found a way to make sure no teachers were furloughed while keeping class size small. Most importantly, we were able to preserve Camino Nuevo’s culture. If anything, we emerged from the recession with more trust in each other and more confident that if we worked together we could accomplish more. We believe that if this collaborative approach could work at Camino Nuevo, it could work everywhere. Too many students in L.A. are under-educated and underserved by the status quo. It would benefit everyone to elevate the dialogue around public education and avoid easy, divisive labels. Together, we need to press our state lawmakers to address declining enrollment and make sure every school is providing the kind of education and environment in which students, parents and teachers belong, thrive and stay. John Ildefonso is an arts teacher and the president of the Camino Nuevo Teachers Association. Dr. Ana Ponce is the former CEO of Camino Nuevo Charter Academy and current executive director of the nonprofit grantmaking education organization Great Public Schools Now. Dr. Ana Ponce is the former CEO of Camino Nuevo Charter Academy and current executive director of the nonprofit, grant-making education organization Great Public Schools Now. John Ildefonso is an arts teacher and the president of the Camino Nuevo Teachers Association.